Ellipticine (NSC 71795) hydrochloride is a potent antineoplastic agent; inhibits DNA topoisomerase II activities.
. Stiborova M, et al. Molecular mechanisms of antineoplastic action of an anticancer drug ellipticine. Biomed Pap Med Fac Univ Palacky Olomouc Czech Repub. 2006 Jul;150(1):13-23.
. Stiborova M, et al. Ellipticine cytotoxicity to cancer cell lines - a comparative study. 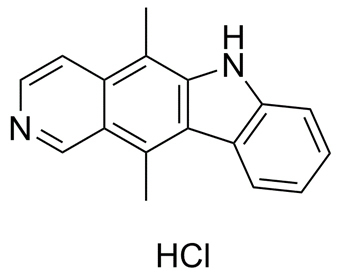 Interdiscip Toxicol. 2011 Jun;4(2):98-105.